When Reggie meets Snake, though, he doesn’t give her much of a choice. Snake has a neck tattoo, a Twizzler habit, and a fair share of arrogance, but he’s funny, charming, and interested in Reggie. Snake also has an ex-girlfriend who's seven months pregnant. Good thing Reggie isn’t a romantic. 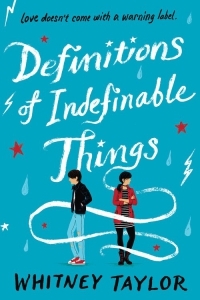 Definitions of Indefinable Things follows three teens as they struggle to comprehend love, friendship, and depression - and realise one definition doesn’t always cover it. Reggie isn’t really a romantic: she’s been hurt too often, and doesn’t let people in as a rule. Plus, when you’re dealing with the Three Stages of Depression, it’s hard to feel warm and fuzzy.